I will be soon receiving a cartridge of Kodak Vision3 200T super 8mm 7213 to use with my Canon Autozoom 814E. I will film only outside using the camera internal 85 filter. Hope that it is still good. I will need if possible some information about how will my camera read the cartridge in terms of iso/asa and do i need to make changes in the exposure? Personally I would use an external spot meter set at 1/58 for that camera. The camera will probably meter it somewhere in the 160 to 250 range which is dead on for the most part. How good that meter is??? If it is overcast or in heavy shadow, what ever the camera meters, I would add one stop. In full sun, I wouldn't worry at all. Have fun. Mr. Burke and Mr. Dunn have given you solid advice/resources that I'd like to expand upon. I would consider investing in one of these http://www.tiffen.com/displayproduct.html?tablename=filters&itemnum=5885B rather than trusting the internal filter. Unless your camera has been recently serviced or was very well taken care of, there is a possibilty that there are some scratches or dust stuck to the filter and it would be a shame to discover that after spending your time and money shooting your film. I'm also not a fan of automatic exposure but I realize it works for some people; however it seems like you need some peace of mind and the only way you're going to get that is by knowing how to use manual exposure. To be honest, I've never shot 200T, so I hope somebody else can correct me if I'm wrong but I have heard that it's best to overexpose 200T by one stop. Adding your filter would make the total overexposure 1 2/3 stop. Now, the shutter angle of the canon 814E is variable so you need the chart to give you the shutter speed, which you can find here http://www.mondofoto.com/manuals/canonautozoom814electronic/ Let's imagine you're using the open setting on your shutter at 24fps, which gives you an exposure time of 1/58 second. Using the exposure formula (25xf-stop²/ISOx1/exposure time), so if you use f/2.8 with your film stock we would have 25x2.8²/200x1/58, which (if my calculations are correct) would give us 56 footcandles, therefore, with your filter and overexposing the film you would set your f-stop at 1.4 with 56 footcandles. Then you simply double your footcandles for each stop (112 for 2, 224 for 2.8 etc.) Now if you don't have a lightmeter you can rent them for a reasonable price, or if you have an iphone you there is a light meter app that is aproximate and it has worked very well for me in still photography. If you set the shutter speed for 1/60 and the ISO ate 200 on the phone and your camera shutter at open, then you just have to remember to overexpose the phone light meter reading by 1 2/3 stops. Edit: I realized I changed the ISO from 200 to 250 which is a big error and I apologize and I also included the exposure time 1/58 in the original footcandle formula which should only read "exposure time"
First, the meter seems to by ok, it reacts with the light changes. I have a gossen light meter and i will test the camera reading with the reading of the gossen meter. I will also find a iphone meter and see the readings with it. So again, thank for the info. Right on, sounds like a good plan. Have fun! So thinking of using the kaccema cassete i started to wonder what iso/asa will it have. With some study i finally understand how this works and i think the topic should have started with the question : how does a camera recognize the cassete. And with this page http://super8wiki.com/index.php/Super_8_Cartridge_Notch_Ruler the mystery (for me) is over. So the kaccema acts as 64T/40D and has no filter notch (but i think the filter with the Canon camera is always on). 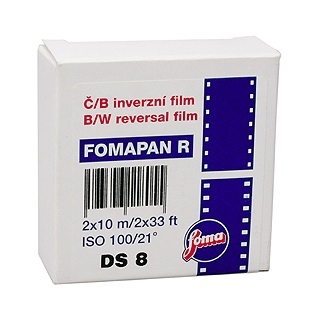 The Foma Ds8 is iso 100. Any thoughts on the results using automatic exposure? Double Super-8 is 16mm. wide so you can't use it in a Super-8 cassette. It is for use in a DS-8 camera. You run the film twice through the camera, exposing half each time, and it is slit to 8mm. after processing. Yeah, but now you should try to get your hands on a DS8 camera and process that as 16mm for a nice split screen effect. Anyways, If you were to load any other film into that cassette just calculate the footcandles needed for f/2.8 as we did so with the vision 200T, then calculate the footcandles needed for ISO 64 and ISO 40 to find the difference. That will give a basis for compensating. Either way, unless you load film with an ISO of 64T/40D, the camera will automatically overexpose your film. Depending on the film's ISO will determine how much that overexposure will be. Anyways, If you were to load any other film into that cassette just calculate the footcandles needed for f/2.8 as we did so with the vision 200T, then calculate the footcandles needed for ISO 64 and ISO 40 to find the difference. That will give a basis for compensating. Either way, unless you load film with an ISO of 64T/40D, the camera will automatically overexpose your film. Depending on the film's ISO will determine how much that overexposure will be. OP, you don't need to 'calculate' any 'footcandles', just set the ISO on the meter. The 814 reads cartridge notches so the 200T will not be overexposed. Yeah clearly I'm overthinking. I'm just of fan of formulas. I am going to cut the Ds8 in the dark room and load only half in the cassette. I've found that i have a romanian reloadable cassette that is notched at 100 iso. WHat you have is 100' of film 16mm. wide. That's what DS-8 is. You will have to slit the entire roll widthways, then cut each roll in half. You will then have 200' of super-8. In any case you can re-notch a cassette. The Ds8 http://www.freestylephoto.biz/static/images/product/411802/lg/411802.jpg is 2x10 m. So after cutting i will have 20 m of super 8. The cassette is 15 m.
I made an incorrect assumption about the length, but I can assure you that what you have is 10m of film 16mm. wide with Super-8 perfs along each edge. It will not fit in a Super-8 cartridge without slitting. 2x10 refers to the length after slitting to from DS-8 to Super-8. I repeat, Double Super-8 will only run in a DS-8 camera. But if i cut the film prior to the filming, in the dark, will it be ok? You have to slit the entire roll in half, very accurately, lengthways so that it is 8mm. wide. You will need a slitter and rewinds. Yes, i have the russian ds8 splitter http://img12.olx.ro/images_mercadorro/80781536_2_644x461_2-8mm-super8-dispozitiv-de-taiat-film-2-8-sau-ds8-film-splitter-fotografii.jpg . I used after i filmed ds8 with the russian ds8 camera, and the film was cutted ok. Yes, i will have to cut in the dark but i think i have figured out a way. Will come back with pictures. It's a great camera, but you might want to consider just letting it auto expose. the AZEs have a problem with the manual aperture. There is a rubber wheel inside the camera that controls it, and they tend to get brittle over time. So you set the aperture, and it starts to drift wildly all over the place. The auto aperture works differently, and tends to do a (reasonably) good job. Here's a link to a repair site (Japanese), if you're brave. For mine, I just live with it. Everything else on the camera works great, and I mostly shoot "run-and-gun" stuff on it, outdoors. Here is a prototype for the ds8 cutter. I've seen this ideea in a book, it was something made by Jobo. Regarding opening the camera... at the moment i don't want to take any risk but thx for the link!